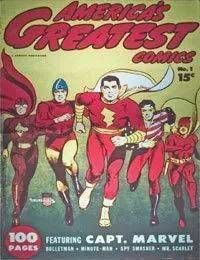 Ghost of the Deep!<br />Bily Batson, radio reporter, has been given the power to become Captain Marvel -- Mightest Mortal Ever Born on Earth -- merely by pronoucing the magic word -- Shazam! -- and well it is that we have Captain Marvel, for these peace-loving shores comes a weird, ruthless menace: The Ghost of the Deep!<br />The Riddle of the Ages!<br />Murder Lurks in the back streets...and one by one victoms disapear into nowhere never to be found again! What is the incredible myster of the Invisible Man? Only Bulletman can answer that stirring question -- only he can solve The Riddle of the Ages!<br />Death Doesnt Whisper (Text story)<br />Duel of Death<br />Minute man, dont attempt to rescue us- its too terrible! Even now Death is staring at us-- these words came over the phone sending the One Man Army on a never-to be-forgotten trail of a ruthless murderer! A killer known as Mr. Skeleton...who Challenges Minute-Man to a Duel Of Death!